Westport yachts are known for their reliability and stylish design, and Relentless is no exception, combining a contemporary profile with performance on the water. This proven model offers ample onboard spaces, flexible accommodations and comfortable cruising for life at sea. Boasting a custom interior that makes use of warm cherry wood, marbles and a light palette of soft furnishings, Relentless features five ensuite staterooms, accommodating 10 guests, including a generous full beam, on deck master suite, two additional VIP kings, 1 queen and 1 twin cabin (twin convertible to king). The main salon is home to a formal dining table for 10, with a more casual space to the aft of the salon consisting of a relaxed L-shaped lounge seating and a walk behind bar, with direct flow out to the expansive aft deck which features a large custom wrap-around settee, table and bar. Relentless is the only Westport built with a full sized wet bar in the main salon, perfect for entertaining. A second large guest space is the Skylounge located on the upper deck, with lounge seating, a bar with a custom crystal cabinet, cocktail cabinet, custom glass game table, and oversized windows that offer enviable views and ensure that this space is light-filled and bright. Moving forward from the skylounge is the pilothouse, which offers similarly excellent views and casual seating for guests. Aft of the skylounge is additional outside guest space, with L-shaped seating and a Jacuzzi. The flybridge features more sunpads, BBQ grill, and two umbrellas adding optional shaded areas, providing an optimum spot for relaxation. Additionally, the bow offers a sunken private seating area. All guest spaces are well appointed and luxuriously fitted, with a flexible layout so the cabin configuration can be altered to suit all group make-ups. The master suite has many features including a custom bed, walk in wardrobe, spa tub, a built in desk and full entertainment system. Relentless has been well maintained ensuring she is in peak condition, complementing the many extra upgrades commissioned during her build where no expense was spared. 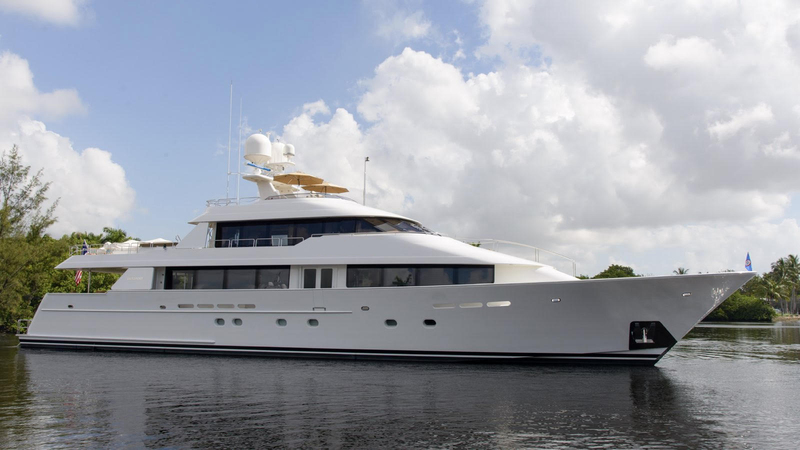 She is the perfect yacht for cruising the pristine waters of the Bahamas. Her shallow draft, complete compliment of water toys and experienced crew make her a favorite amongst charter guests.